How authentic is the fare at Epcot's International Food & Wine Festival? September 5, 2017, 11:22 AM · Walt Disney World's Epcot has been offering its visitors a taste of the world since it opened in 1982. In 1995, the tastes offered by World Showcase were supplemented with the Epcot International Food and Wine Festival, offering visitors even more flavours from even more places... but have you ever stopped to wonder just how authentic those tastes are? 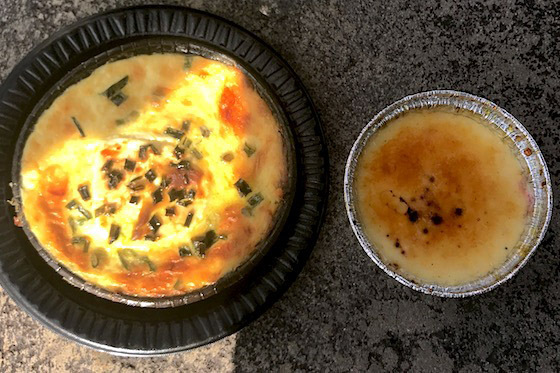 With myself being an Australian who’s lived in Scotland for the past decade, and my fiancee being a Quebecker (and thus familiar with both French and Canadian cuisine), we thought we’d share with you out thoughts on just how well Epcot treats our home cuisines. For our experiment we selected two food items from each booth, both sharing each item. Although we’ll certainly talk about the flavours of each dish, we’ll also be talking about just how authentic each dish is, including the selection of ingredients and taste. This year, Australia offers three dishes: Grilled Sweet and Spicy Bush Berry Shrimp, a Lamb T-Bone Steak with mint pesto, and a Lamington. Although Paul Hogan did a good job of convincing the world that Shrimp is THE Australian dish, and I’ve certainly had more than my share, I can’t say I think of them as a particularly Australian dish - when we do have them we don’t even call them shrimp (we call them prawns), so I wasn’t inclined to pick this dish. But the lamb T-bone certainly did grab my attention. Australia is said to be the country that grew up on the lamb’s back; Grilled Lamb is a staple of any Australian summer barbecue, whereas a nice roast leg of Lamb is to Australia day what Turkey is to an American Thanksgiving. I’ve never heard of a lamb T-Bone before, but I’ve certainly had more than my fair share of lamb chops, which this appeared to be. The actual dish itself I thought was done very well. 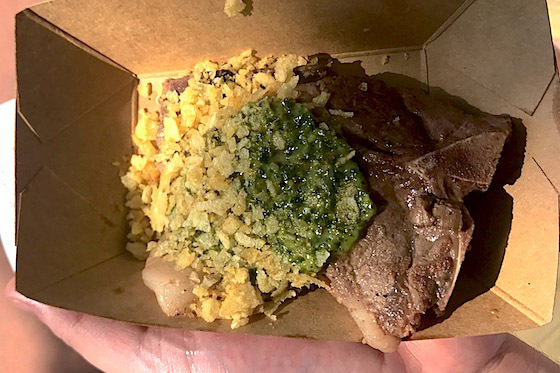 I don’t normally dress my lamb with little more than a bit of rosemary, but the mint pesto was a great touch; often I find mint with lamb overpowers the meat, the sweetness destroying the lovely natural gamey flavour that was the whole reason I wanted lamb in the first place. I was delighted to discover however that the mint was little more than just a hint, and enhanced the flavours rather than replacing them. 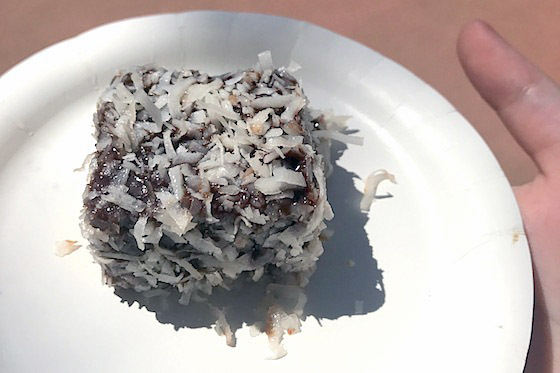 The lamington I was surprised to see on the menu; these are a common sight in any fundraising bake sale or a family picnic. However you’re more likely to find a recipe in the Australian Woman’s Weekly than a celebrity chef cookbook, so I think it was a little out of place in its surroundings. A basic lamington is simply a sponge cake covered in chocolate sauce and rolled in enough coconut that you’ll be finding it in your teeth for days afterwards (although they’re often dressed up with a layer of strawberry or raspberry sauce between sponge pieces, which this version wasn’t). I found that the chocolate sauce was a bit thicker and loser than I’d normally expect to find on a classic lamington, but the flavours were spot on. This would be a lamington any Country Women’s Association would be proud to serve. Over at the Canadian booth the soup de jour is a Cheddar Cheese Soup, along with a Wild Mushroom beef filet mignon. On a 35C/95F hot day, a hot cheese soup was certainly not what we’re looking for, but we did find the soup to be a nice rich and creamy dish where the flavour of cheese really stood out, with a hint of smoke and salt from the bacon. However this doesn’t talk about whether or not the dish is truly authentic, and for this I’ll defer to the judgement of my fiancee. The flavour of the cheese tasted to her like the strong flavourful cheese she is used to from Canada; however she hasn’t ever seen a cheese soup on the menu, but has experienced cream soups that are similar in texture to this soup; but cheese is very much optional in these soups rather than an essential component. The filet mignon was lovely and tender. I don’t know how she can possibly tell, but my fiancee insists that she can tell from the taste that this was the beef was definitely Canadian (She’s been eating British/Irish beef for the last two years). We’re not ones for sauce with steak usually, but a buttery sauce I am assured is very Canadian with steak, as is mushroom with beef, so needless to say she was very impressed with the dish. 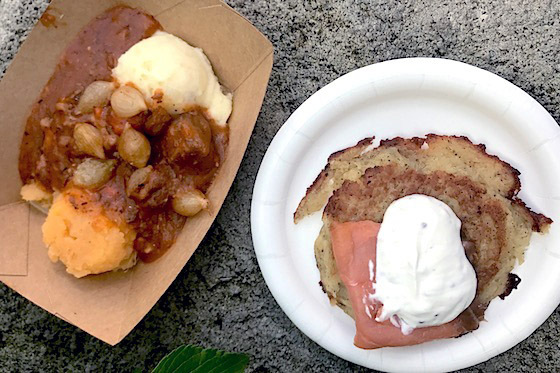 Available at the Wee Scottish booth this year is a Traditional lamb stew, a potato pancake with Salmon, and a Tipsy Laird cake (whiskey soaked cake). We decided to have the two savoury dishes. Starting with the stew: I honestly can say I can’t recall ever seeing lamb stew on the menu in Scotland, especially not with “Neeps and Tatties” (mashed turnips and potatoes). It's clear that the lamb is a stand-in for what should be served here - Haggis. That said, even if it wasn’t the case that Haggis is illegal in the US (the FDA for some strange reason object to eating lungs), it probably would be a hard sell. The turnip and potato mash was lovely, creamy and sweet, and the dish was served cooler than you would expect a stew to be served (perhaps as a nod to the extreme heat of the weather). Although the dish didn’t feel particularly traditional, it was my favourite dish of them all. The potato pancake (or “Tattie Scone” as we call them in Glasgow) are a common breakfast item. You won't often find them as a base for Salmon, but as a individual item in a “five item breakfast” or on a roll for those on the go, perhaps with a bit of ketchup. The Pancake/scone itself was a bit thicker than I would have expected - it probably has to be to support the toppings, but otherwise was good and flavourful; although it might not be the most traditional of servings, it definitely was a tattie scone, and let's face it anything with smoked salmon is good. Firstly, I want to say something about the dish we didn’t have — Croissants with Escargot. I turned to my Fiancee after reading the board and said “This has to be some sort of mistake. One of those is a breakfast food, the other one certainly is not a breakfast food.” My fiancee agreed, and couldn’t think of any situation where that might be an appropriate pairing. So instead we had the Goat Cheese with spinach, and the Crème Brulée. The Goat Cheese didn’t agree with my palette at all, I found it to be just a slime with a spinach taste, but my fiancee assured me that the dish was actually spot on and would be an excellent starter or side. She tells me the spinach was certainly fresh and goat cheese creamy, and although it was a bit hot for the day, she kept going back for more. She definitely could see this item on a French menu, especially in the way it was presented with a herb topping. We both however enjoyed the Crème Brulée. The hard caramel top shattered with a satisfying crunch, under the caramel sat the cream and what is billed as a Raspberry Jam, but seemed to be too liquid to be a Jam and instead was perhaps more of a couilis, however the cream replaced the traditional custard that would be expected. Given the hot conditions, this was perhaps more enjoyable than a custard would have been. Overall, although some creativity has been shown in the dishes we’re used to, they were certainly recognisable to us, in sight, smell and flavour and broadly paid respect to the cuisines that we are used to - with a few notable exceptions. It’s clear to see why the Food and Wine festival is a must-do for any Disney fan, and why the crowds keep coming back year after year. September 5, 2017 at 1:03 PM · This is interesting. 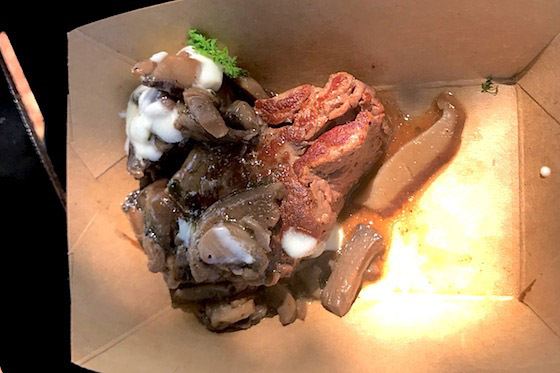 I never really considered the authenticity of the dishes presented at the EPCOT F&W Festival, and had typically assumed them to be predominantly caricatures or stereotypes of items from the designated country/region. Having spoken frequently with Chef Justin Watson at Busch Gardens Williamsburg, who drew inspiration from the EPCOT F&W Festival for his park's festival, there are a lot of considerations that have to go into creating these menus. The most obvious one is that the event needs to be popular yet profitable. The popular part of the equation means that the dishes need to be presented to guests in an accessible way while still being affordable. The profitable part means that ingredients and cooking techniques need to be readily available and simple to execute to reduce the raw costs. The food industry runs on the lowest margins of virtually any business, and creating thousands of little plates of a dish few average theme park guests have tried or even heard of that may contain some unusual, hard to get, or expensive ingredients, can make creating interesting, familiar, yet profitable dishes difficult to compose. Add the complexities of assembling dishes in tiny booths with limited equipment and staff that generally lack deep culinary backgrounds can force festival creators to dumb things down a bit and play to cuisine stereotypes. Honestly, it's quite a feat what EPCOT pulls off every year, and the continuous expansion shows that they're not only making good money off the event itself, but achieving the initial goal of the festival 22 years ago to encourage more guests to visit WDW during a typically slow time of year. I'm not a professional chef, but I'm continuously in awe at the spectacle that the EPCOT F&W Festival is every year, and what their culinary team is able to achieve. Beyond the kiosks located in EPCOT, there are hundreds of other seminars, demonstrations, meals, parties, and associated events that contribute to the overall F&W experience. EPCOT's festival has inspired just about every theme park operator in the country to develop their own similar food and beverage festival, while the "granddaddy of all food festivals" continues to get bigger and push the envelope every year (raking in more and more of guests' money as it goes). September 5, 2017 at 8:15 PM · I'm sorry that the escargot croissant failed the authenticity test, but I do like it! September 6, 2017 at 6:11 AM · I would note that the last time we were at the EPCOT F&W Festival (2014), they served traditional escargot with croutons/toast points. I wouldn't be surprised that they ditched the traditional presentation to make the dish more accessible and to reduce food costs. The previous plating was 6 snails, and based on the photos I've seen, the new croissant probably doesn't have more than 3 inside, meaning lower food costs, and easier plating since the servers just have to place the pre-made pastry on a plate with some garnish. I also believe Chef's de France serves escargot in the traditional manner if you're itching for the classic dish. 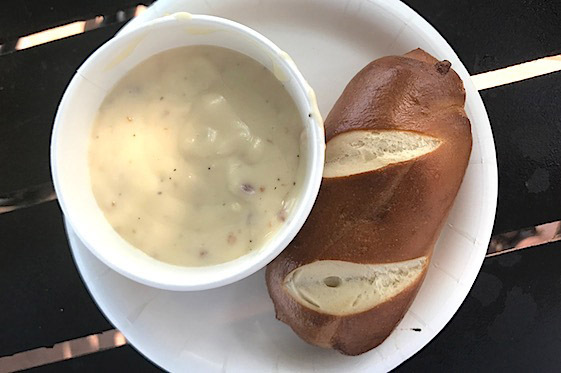 September 6, 2017 at 6:40 AM · Been going to the food and wine festival for quite a few years now and I must say the Canadian Cheese Soup and the Filet Mignon are staples. I would not go without getting both. Authentic or not they are just great food. What happens to your vacation if a hurricane hits Florida?